Visitors to Oregon find Linn County on I-5 located between Salem and Eugene. Those taking a day trip to this area can discover two fascinating attractions: Shedd’s Thompson's Mill Historic Site and Albany’s Carousel Museum and Workshop. Some communities try to entice people to their downtown by building a river walk or developing apartments. 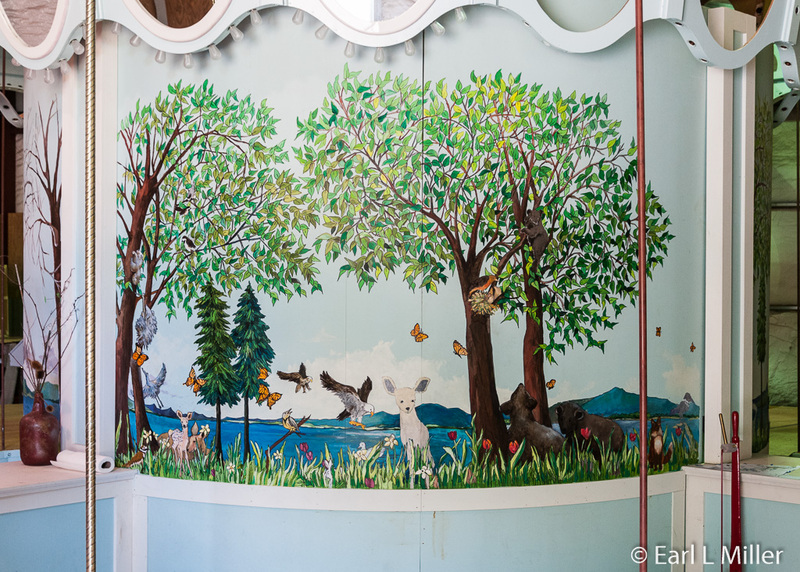 In Albany, more than 200 volunteers have actively participated in constructing a handcrafted carousel. In its twelfth year, the project is expected to be completed in four more. We were fortunate to meet with lead artist, Gwenn Marchese, who gave us a tour of the facility. She provided us with the history and explained in detail how they are accomplishing this feat. Carousel board president, Wendy Kirbey, came up with the idea when she attended an Altrusa International Conference in Missoula, Montana in 2002. At a presentation, she learned the town’s carousel had been part of their downtown revitalization. She brought the idea home to attract visitors to Albany. Originally, the Board was going to pattern their carousel after Salem, Oregon’s, but then they decided to do it their own way. They opened a carving and painting studio to anyone who was age fourteen and older, regardless of skill and background. Then the process of getting animals adopted, carved, and painted started. People learned as they painted or carved beginning projects and advanced at their own pace. No classes were ever taught. Those who have participated come from a wide variety of occupations. 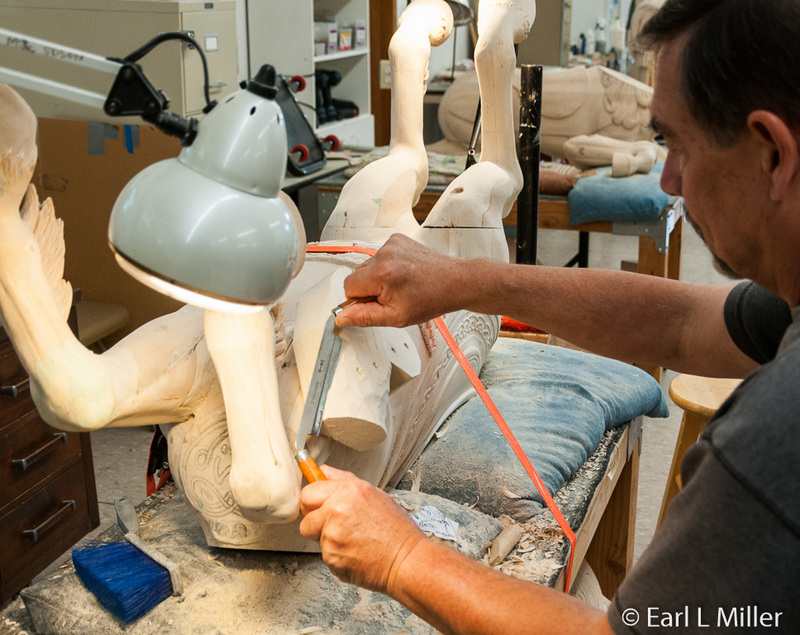 For example, Jack, the lead carver is a computer specialist at LinnBenton Community College. Pete Slenning, who does the clear-coating of the animals has an auto refinishing business. He is also a very capable carver. Sponsors pay different amounts for the animals depending upon which row they’ll be placed. It’s $10,000 for the outside row, $7500 for the middle row, and $5000 for the inside row. The studio has completed 30 creatures. Eventually, this menagerie carousel will have 52. Some will be held in reserve. Forty percent will be horses while the others will range from Pegasus, a unicorn, and a dragon to a seven foot plus tall giraffe, bears, dogs, and cats. We observed several people painting and carving the day we were there and saw several finished animals at the workshop. Sponsored by a veterinarian, Quigga the Quagga is a species of zebra that became extinct in the 1880's. 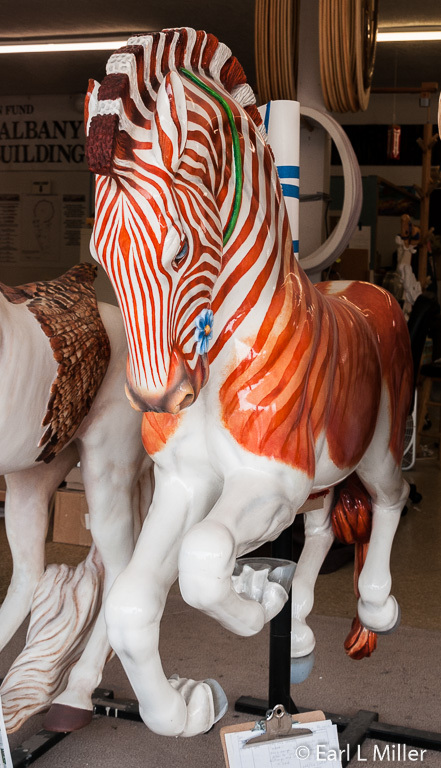 The museum touts this as the only Quagga carousel animal in the world. Sampson, the Rhode Island Red Rooster, was chosen by his sponsor because he raised chickens as a child and because the animal is somewhat unique to carousels. The names of the sponsor’s three grandchildren are inscribed in the purple tail feathers. 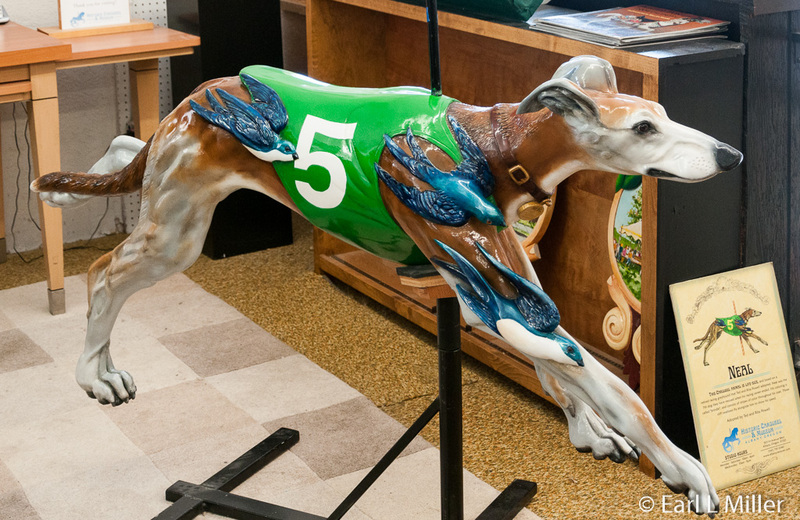 Neal the Greyhound is based on a retired racing greyhound. Neal was the seventh dog that the sponsors rescued. 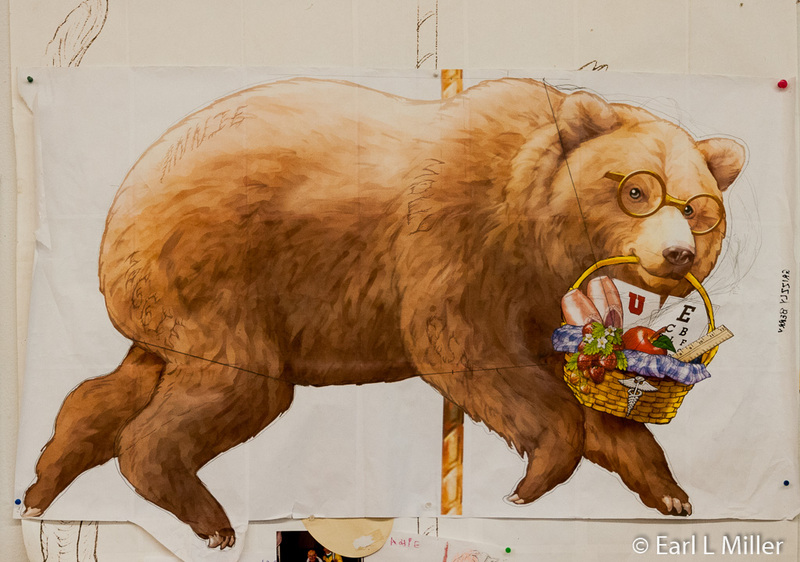 Grizzly Berry, sponsored by an optometrist, wears eyeglasses. He carries an eye chart in his basket. Daisy is a baby African elephant. This singing elephant who will have a mouse on his trunk vocalizing from a songbook. These aspects and the musical notes depict the joy of music in its sponsors’ lives. Names of the family surround the daisies. The animals weigh 100 to 120 pounds and have hollow cavities to reduce their weight. Each has an opening where a sponsor can put in a time capsule. There will be three rows of creatures on the carousel with the outer row stationery and the other two, leapers, which go up and down. It will carry two chariots. One is designed for the physically disabled. Its gates open and the seat folds up allowing a wheelchair to be locked inside. The carousel will be 50 feet across and 24 feet tall. 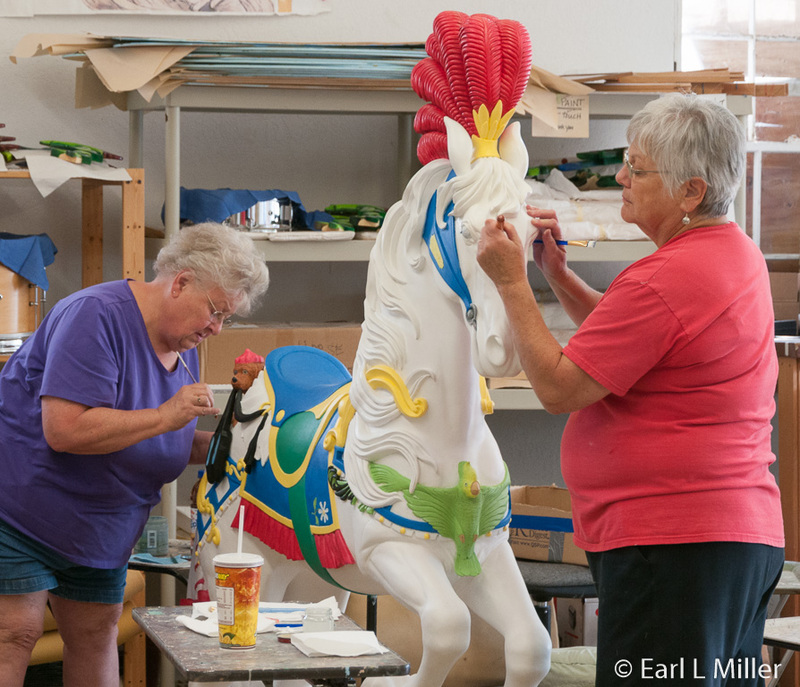 If visitors go to the studio downtown, they can visit a small museum about carousels and watch as well as photograph the carving and painting. 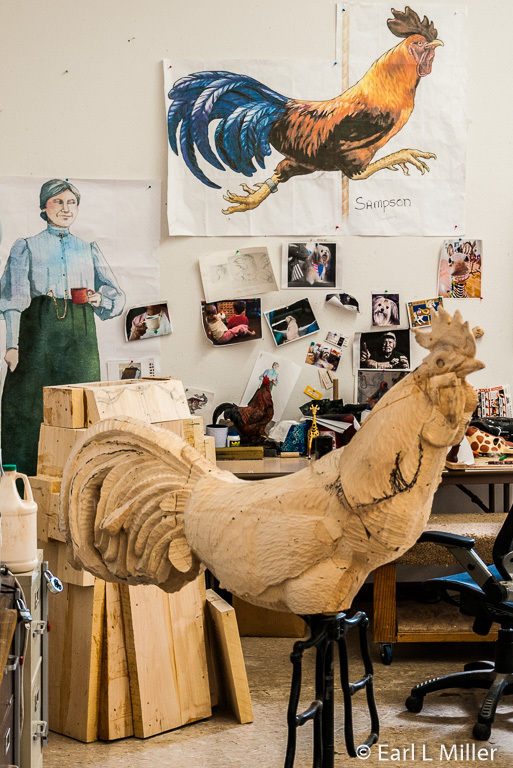 The animals are constructed of multiple pieces of basswood. 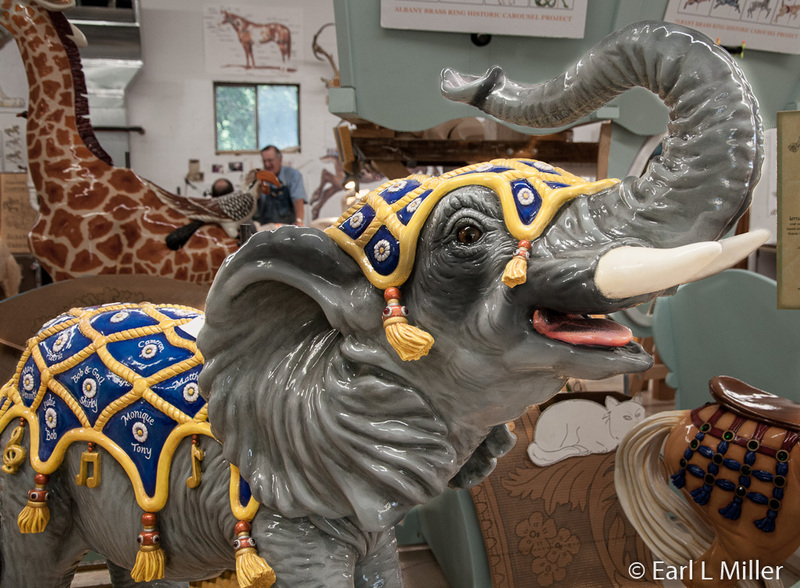 Techniques combine the true-to-life anatomy of the creatures they represent with the style of the master carvers of Dentzel and other premier carousel manufacturers. The carvers use Basswood which comes mostly from the Wisconsin area. That’s because the really cold winters in the area produces the best wood to work with. Basswood also has other needed characteristics. It’s lightweight, has a tight grain, very few knot holes in the wood, and few increments. It’s known as the traditional carving wood. The painting process, “stippling” is time consuming and exacting. Volunteers use oil paints and document what colors are used on each animal. That way when it’s time for repairs, the paint mixtures will be handy. The whole job consists of three coats of primer, three coats of the main colors, then shading, highlighting and additional fancy stuff. 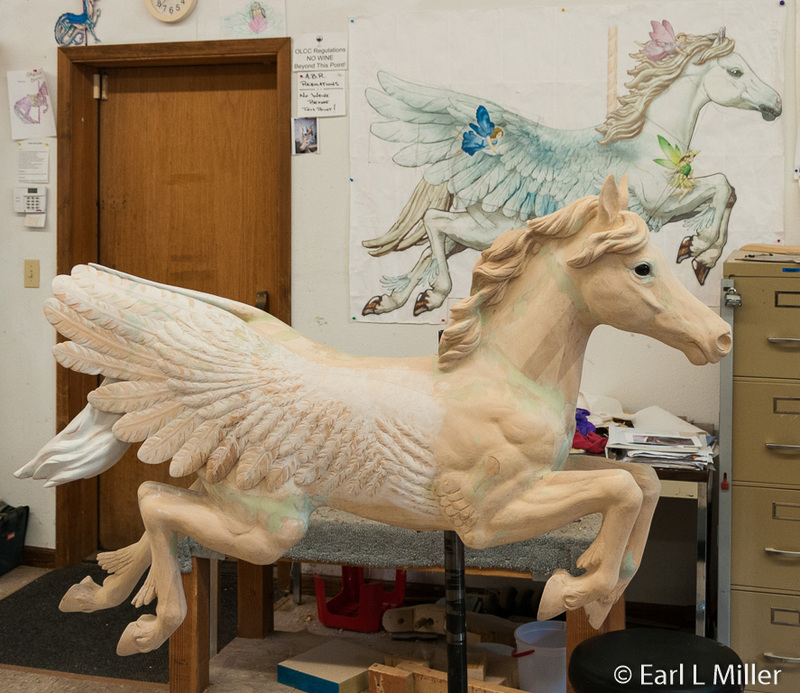 On average, it takes about a year to paint a carousel animal followed by a six-month drying process before the automotive clear-coat is applied. You can visit the carving and painting studios and museum Monday through Saturday from 10:00 a.m. to 5:00 p.m., with the exception of Wednesdays when it closes at 9:00 p.m. It’s located at 503 First Avenue SW, on the corner of First and Washington in Albany. Admission is free. The telephone number is (541) 791-3340. We followed Gwenn, in our car, to where the carousel is being temporarily assembled on private property in North Albany. Besides the animals, the carousel requires many other parts as well. Tours to see these and the mechanism are available on Saturdays. Call (541) 791-3340 for directions and to schedule a spot on the free carousel mechanism tour. Rounding boards, the large horizontal panels on the outside of the carousel, are found above head height. Their largest feature is a high oval mirror. Above each mirror is a small horse head. Part of each rounding board’s side is covered by a jester head shield. Below these mirrors is a 14-inch diameter circle with a painting of a historic structure or event in the mid-Willamette Valley. These include covered bridges, mills, churches, or regional events. Each rounding board costs a sponsor $3500. For that, they choose the subject of the board’s painting. Sponsors also select center panels, which cost $3000 each and cover the mechanism in the carousel’s core. 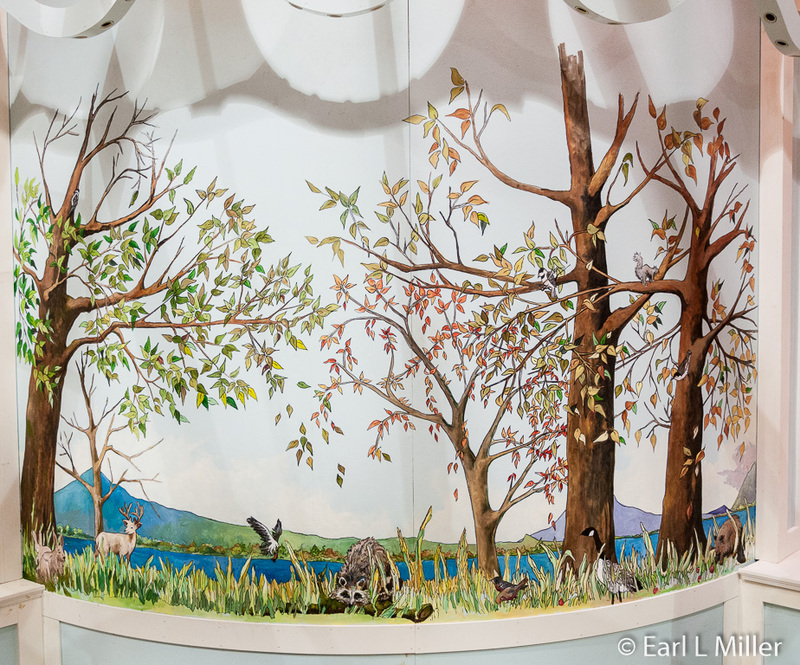 These panels will show a continuous view of the Willamette River during the four seasons of the year. They won’t show the same scene. Winter is the only one not completed. Sponsors also choose small carvings of plants and animals to be applied to the seasonal panels. Mirror panels, sponsored for $1000 each, are interior panels with mirrors and lights. Their main feature is a vertical oval mirror. Rows of lights run along each mirror’s sides. Carved birds, native to Oregon, tie the panel to the beam. Sponsors select the bird they want to appear on the panel. Bill Dentzel, the great grandson of Gustav Dentzel, the founder of Dentzel Carousel Corporation helped to make the donation of a 1909 mechanism possible for the project. It had previously been owned by the American Carousel Corporation and used at Point Pleasant, New Jersey. 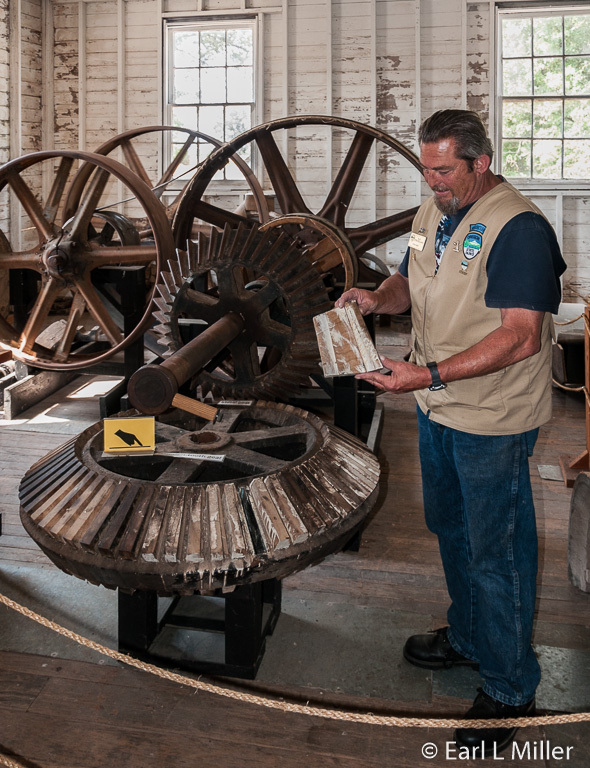 It took the Albany carousel engineers more than ten years to restore the mechanism to working order. It is now fully operational. 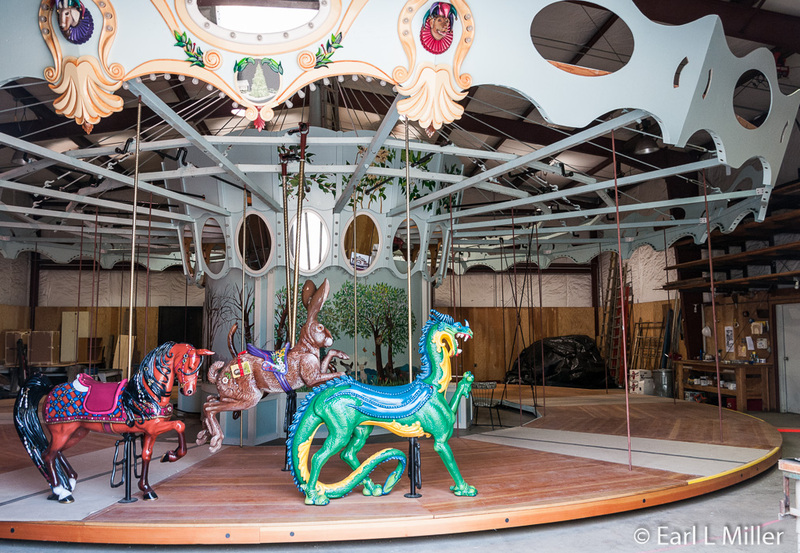 The completed carousel will be located downtown in a new building that the museum will construct. It will have meeting and party rooms as well as gift shop. Of the six million dollars needed for the project, 5-1/2 million has been raised and pledged. 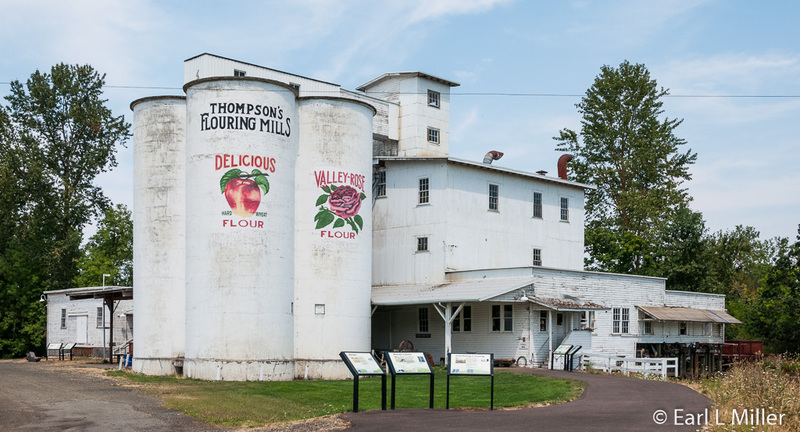 Thompson’s Mills, operated by the Oregon Parks and Recreation Department (OPRD), is located approximately 1.5 miles east of the tiny town of Shedd. Erected in 1858 and rebuilt in 1862, after being destroyed by a fire, this grain mill was in continual use for grain, animal feed, or supplying electricity until 2004. It is now on the National Register of Historic Places and is the oldest surviving water-powered grain mill in the state. Boston Mills was the third area mill established by Richard Finley, who had spent time as a California gold miner between constructing the second and third. He and his partners sold flour to neighboring farmers and to miners who traveled to the gold fields. They also channeled the Calapooia’s waterpower by constructing a system of three dams, head gates, a flume, and turbines. 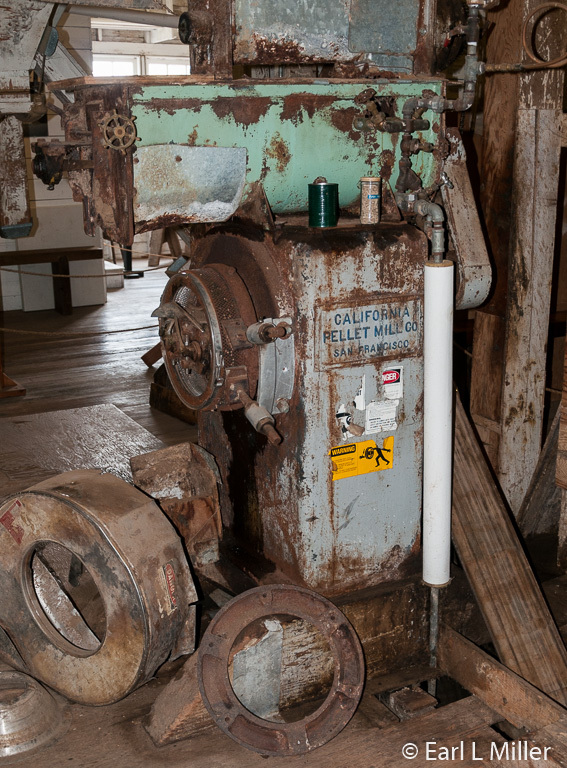 Until 1941, the mill operated solely on energy from its water plant which is still functional today. For a period of time, it went through different families. In 1891, Martin Thompson, a miller, started gaining control. He was the full owner of the mill by 1897. He turned the mill into a commercial enterprise by buying and grinding grain from local farmers and selling flour. Thompson added modern steel rollers to supplement the Buhrstones, renamed the mill Boston Roller Mills, and installed an electric generator to provide the mill with lights. He also constructed the mill keeper’s Queen Anne style home in 1904. The Thompsons had electric lights in their home long before their neighbors. The resident park ranger now lives there. When Thompson died in 1910, his wife, Sophia, and sons, Otto and Leo, formed a partnership to operate the mill. They changed the name to Thompson’s Flouring Mills. 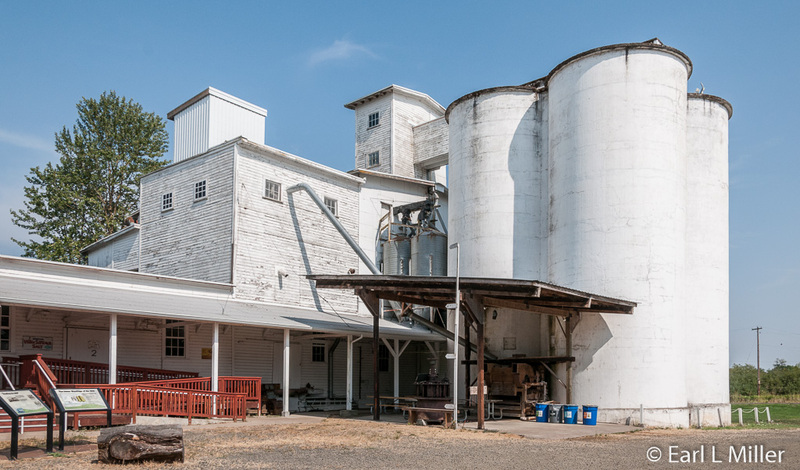 After Leo’s death, Otto improved the mill in 1917 with four 50-foot concrete grain silos, the first built in western Oregon. Other changes included major warehouse expansion space in the 1920s and improvements to the mill office in the 1930s. They switched from a wagon and horses to gas-powered trucks. During World War I, the mill operated 24 hours a day selling flour to the U.S. Food Administration, which administered Belgium famine relief in Europe. President Herbert Hoover, associated with this relief, signed the mill’s deed in 1891 when he was age 17. They sold products under a variety of trade names such as Valley Rose, Cream of the Valley, Delicious Apple, Oregon Main, Flavor, and Thompson’s Best. In 1946, the mill switched from the production of wheat flour to animal feed requiring more diverse ingredients but similar machinery and processes. It couldn’t compete with the larger mills who were grinding wheat. When Otto died in 1965, his son Myrtle took over management. The Babits family purchased the property in 1974. Because of overloading, a summertime collapse of a major portion of the mill occurred in 1979. However, the company quickly made repairs. In 1986, the Babits acquired a water-powered electrical generator and started selling the electricity produced by the mill’s waterpower to the Pacific Power and Light Company. The next year, they signed a 20-year Powered Sales Agreement to replace the decreased feed milling. Part time and specialty milling continued into the 1990s. They also sold Christmas trees from their Christmas Hill Tree Farm. Their last product, made in 2002, was mushroom growing soil. In 2004, OPRD purchased Thompson’s Mills. Today the 23,000-square-foot mill has five above ground levels and a full basement. 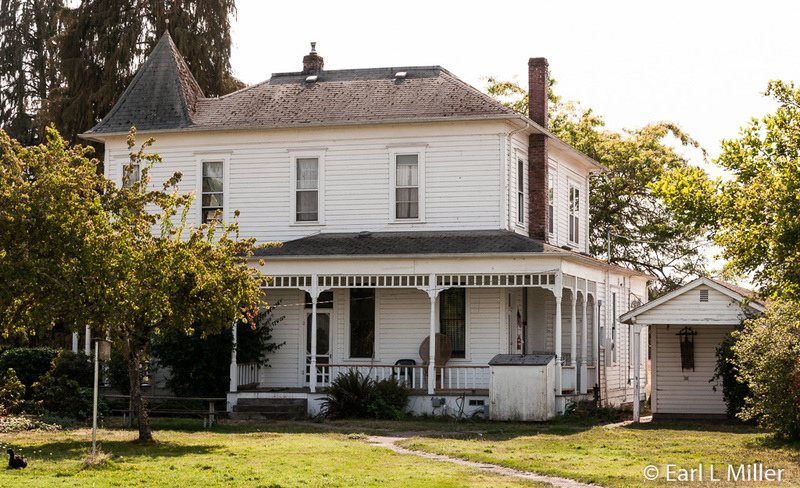 The site also includes the Queen Anne house, a carriage house, a hay barn, a service bay, and a garage/shop. Today, the carriage house, constructed in 1907, is used for storage. It was never used for carriages. It always had a car. The hay barn (circa 1904-1907) was primarily used as a horse barn to house the teams that delivered flour and feed within a one-day trip from the mill. A north addition to the mill, which raised the floor, made for ease in loading wagons and later trucks. This area was used for the drying and storage of feed sacks. A garage/shop was added in 1918 while the 1982 service bay housed vehicles and auto related tools. Visitors also notice the chickens and ducks strolling around nearby fields. The OPRD opened this site to the public in 2007. In the future, they hope to bring it back to being a functioning homestead. In 2013, OPRD planted an apple orchard, comprised of 23 heirloom varieties of trees, that is now starting to produce fruit. A heritage garden is also now in progress. The site also hopes to have canning classes, cider pressing, and homesteading activities. State interpreters lead tours of the grounds, the water works, and the still-functioning mill equipment in the main building. These occur daily at 10:00 a.m., noon, and 2:00 p.m. daily Usually, they last 45 minutes to an hour. However, ours, led by Ray Strickland, lasted two hours and was very detailed. He explained the whole milling procedure and allowed us to watch the mill in process. Particularly interesting were several interactive exhibits which make this an ideal attraction for adults and children. Before entering the building, we learned grain came in sacks on a wagon. Grain was weighed and dumped into a pit via a chute. During the early days, the millers ground wheat and corn. Later barley and oats were added to the animal feed. The grain was brought inside, run through a roller, and steamed to flatten it and break it open. 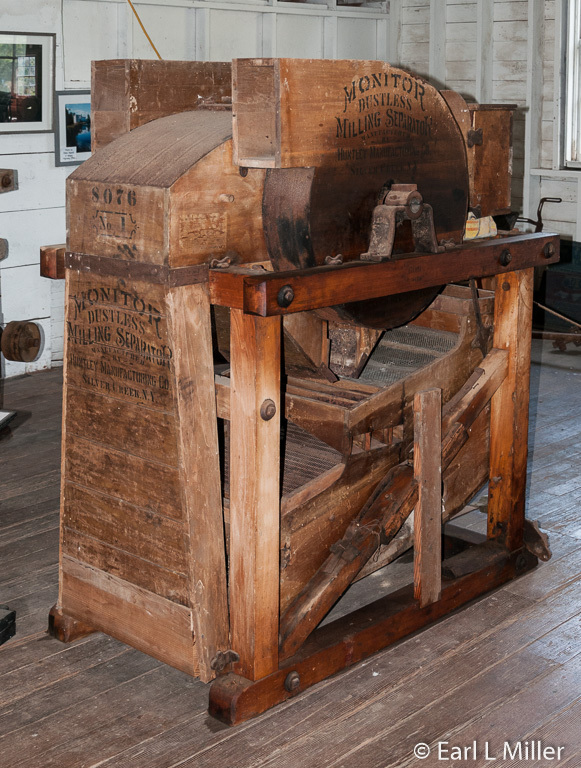 A fanning mill, like a sifter, was used for cleaning the grain. Different size screens allowed smaller and smaller pieces to go through while eliminating rocks. They used fans to screen off the dust. The turbine we saw came from Springfield, Ohio in 1913. It copied one built in France. The water entered the turbine and made it spin around. The shaft out of the turbine’s top delivered power. Finley had one turbine while Thompson added two more. The Babits replaced one to run their generator. 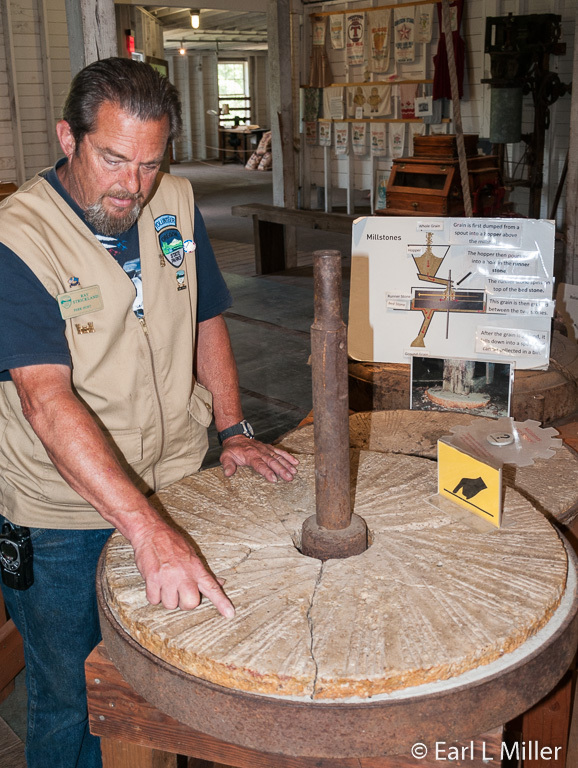 The mill originally used French Buhr millstones. The stone was quarried in France, shipped to Connecticut, put together while on board a sailing ship that rounded the Horn, then sent to Oregon. 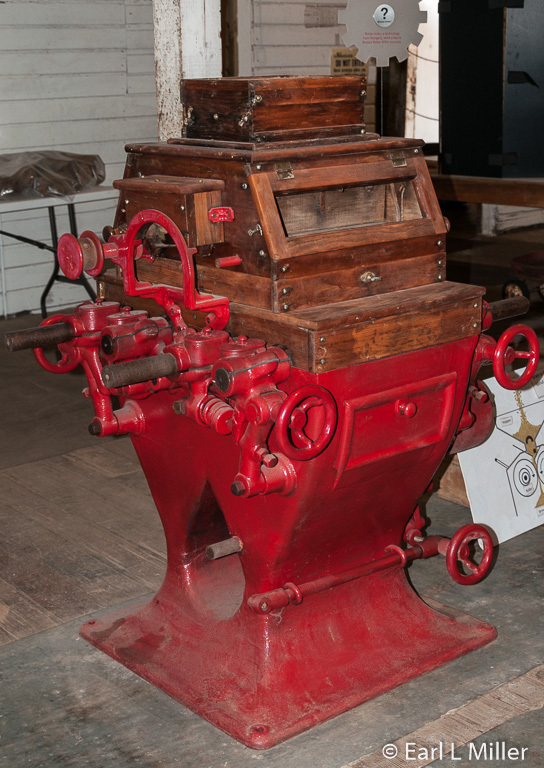 When Thompson replaced it with multiple steel rollers, he could adjust for the kind of wheat by turning the roller mill. Old timers didn’t like his flour because it tasted different since it lacked the impurities of stone. He told them it was cleaner. We observed pulleys that ran the different equipment. Water turned wooden tooth gears which turned the shaft to provide power. A hand powered pulley system was our first interactive. We saw a variety of belts of different materials which we were allowed to handle. Ray explained how augurs move grain to the elevators, then spouts, into the bins and finally the bags. The elevators scoop up the grain. Then wooden/metal spouts carry the grain downstairs. Augurs also carried the grain across the mill into silos. Another interaction allows you to spin the pulley so you can see how all of this occurs. On the tour, youngsters can sift grain and make their own flour. They’re allowed to grind it and put it in the collection box. They can also read about the different types of wheat and flour as well as the parts of a kernel. 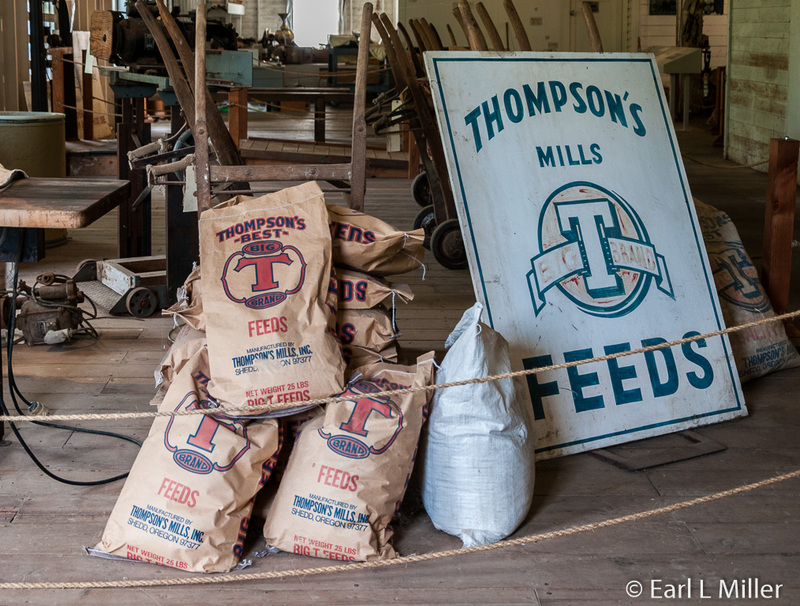 Thompson made several different kinds of flour. He would mix different ones to see how they reacted. We also learned about flour sacks. 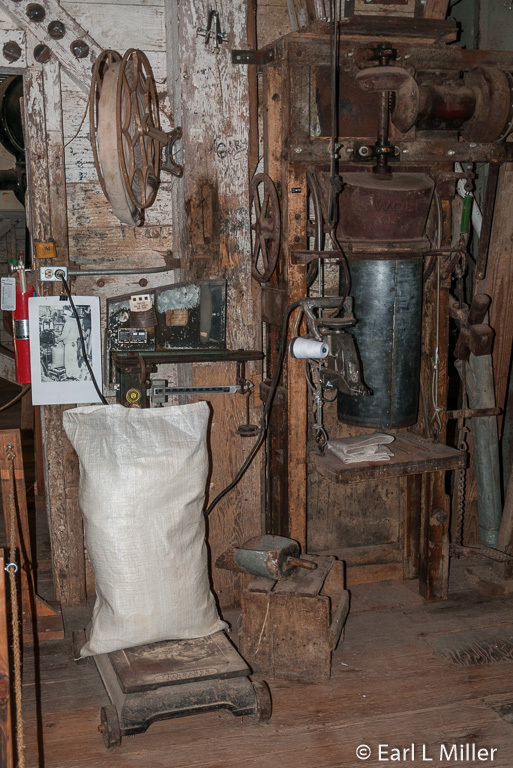 Originally the Valley Bag Company provided some of the original burlap and/or cloth sacks used at the mill. Chasem Golby, and the Glass Bag Co. also provided sacks. Polyester bags came later. No sacks were ever made at the mill. Next was the area for the pellet mill. The ingredients were formed. Two rollers pressed again the dye cutting the pellet off at the right length. After they were steamed and dried, they then went up the elevator and were separated into holding bins. Ray demonstrated how they filled the sack, put it on the scale, then added or subtracted pellets to make 100 pounds. They were then taken by hand truck and put in the warehouse. Another interesting interactive is a miniature example of the mortise and tenon construction techniques used when the mill was first built. This exhibit can be disassembled and rebuilt. Earl went with Ray downstairs to see the turbines, which from the main floor I could hear run. At this plant, you’ll see and hear the equipment operating as you tour. However, nothing is produced. We observed how sacks were sewn by hand with a special needle. It’s a matter of clipping and running the string along. There is no need to thread a needle. The bag is then sewn and the string is cut. Ray also demonstrated the man lift elevator which went up five stories. It’s a combination of manual balance and counter weight. Our final stop was the molasses mixer. It combines grain and molasses. The bag was filled and put on a scale. When it was the right weight, it was sewn and sent to the warehouse. The mill added molasses in the late 1940's and found the animals loved the feed.